When Peter announced to the first believers that they needed to fill Judas’s empty position*, he used a phrase that always glares at me. I feel it piercing my heart every time I read it. It’s almost as if those words growl and claw. He prays “Lord, you know everyone’s heart. Show us which of these two you have chosen to take over this apostolic ministry, which Judas left to go WHERE HE BELONGS” [emp. added]. To go where he belongs. Ouch. I think we all know where that is. We all belong somewhere. There is a place where we are going to go. You and I cannot be in two places at once. It is either going to be here or it is going to be there. Only God can be in multiple places. Not even the enemy can do that. There is no spiritual fence-riding. If you think you are straddling that fence, think again. As Peter prayed, God knows EVERYONE’S heart. He knows which side your heart is really on. We fool others and we may even fool ourselves, but there is no fooling God. Going where you belong can be a comforting thought or a frightening one. For a Child of the King, where you belong is in the house of your Father. Where you belong is a place you have longingly envisioned a million times and it will be a million times more magnificent that you ever could dream. 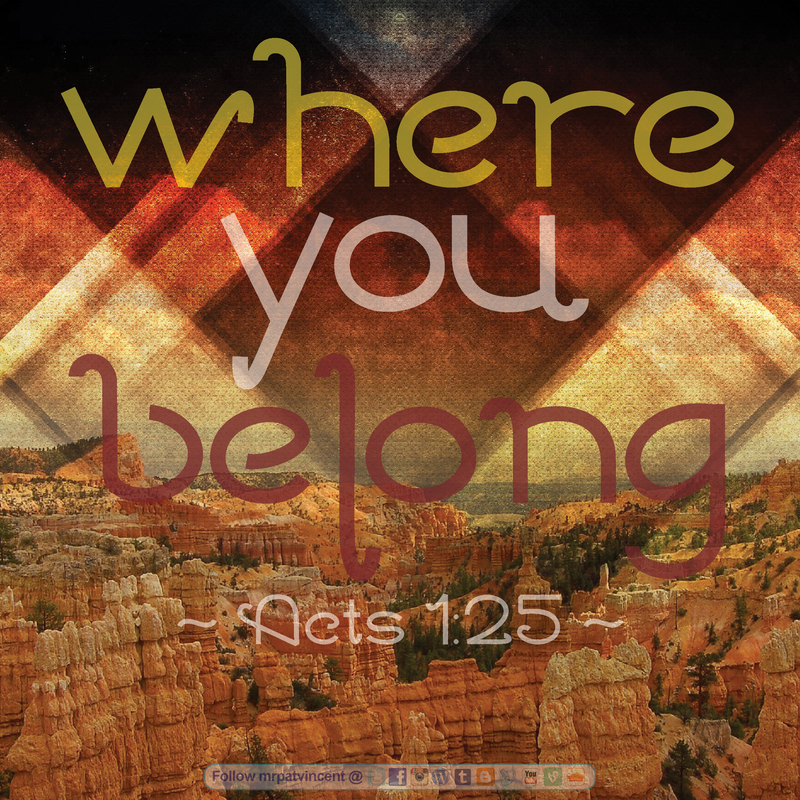 For a child of the world, where you belong is in the house of your father. Where you belong is a place you never ever thought of and it will be a million times more horrifying than you could have ever envisioned. This entry was posted in Christian and tagged Abraham's Bosom, Acts of the Apostles, Amazing Grace, Belonging, Bible, blessed, Charles Stanley, cheerful giver, Child of the King, Christ, Christian, Christianity, church, David, Eternal Salvation, Faith, giving, God, God Bless, God Loves You, God's love, Heart of David, Heaven, Hope, Jesus, Judas, Judas Iscariot, Lord, Mansion, Ministry, New International Version, Not a Fan, Peter, prayer, Preach, Religion, Religion & Spirituality, Religion and Spirituality, Saint Peter, Salvation, Scripture, small blessings, spiritfilledlife, spiritualwarfare, Sweet By and By, Test, Wordpress, Worship. Bookmark the permalink.